I met Stephen Colbert in a stairwell at The Colbert Report. He was on his way to the studio and he stopped me and said, “hey, you must be new!” I was so nervous. He shook my hand and said, “glad to have you on board”. 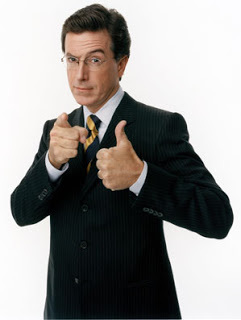 I interned at The Colbert Report in 2009 and it was nothing but an absolute pleasure. Everyone I worked with was excited to be there- there was a constant buzz around the office- it’s hard to dislike your job when your boss is so great. I had the opportunity to interview Stephen for the Neo-Futurists (click here). It was a situation I will never forget. I was walking by Stephen’s office and he popped his head out and said “Willy- come in here”. I thought I was going to be fired. But when I went into his office he handed me a notepad and said, “you wanna interview me?” I nodded and he said, “shoot”. I was so nervous. The next 9 minutes I interviewed my comedy legend. It was one of the highlights of my life. I am very grateful for The Colbert Report, it has done so much for me and for comedy. Risks are essential in comedy. May we all be in a position where we can take as many risks and jump off as many cliffs as Mr. Colbert did. Colbert Report- you will be missed.